Mary (Betty) Bova, 89, of Oil City, PA. and formerly of Warren, PA. died Saturday evening, April 14, 2012 at the home of her daughter. 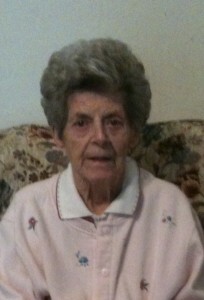 She was born April 6, 1923 in Warren, PA. to the late Leo J. and Dorothy Kerr Turner. She had resided in Warren area most of her entire life and moved to Venice, FL. in 1980. She was a former member of Epiphany Cathedral in Venice, FL and Holy Redeemer R.C. Church. She is survived by her son – Michael P. Bova and his wife, Lynne Lucchino-Bova of Pittsburgh, PA., 1 Daughter – Jill A. Bova and her husband, John of Oil City, PA., 6 Grandchildren Carter Bova, Becca Woodworth, John, Mark and Adam Hutchinson, Joshua Polley, 15 Great Grandchildren, 2 Great Great Grandsons; 1 Sister – Catherine H. Pavletic and husband, Michael of Monaca, PA., 1 Brother – Leo S. Turner of Youngsville, PA., several nieces and nephews. In addition to her parents, she was preceded in death by an infant daughter, Mary Gilorma Bova, her husband of 66 years, Matthew “Mike” Bova whom she married September 19, 1942 in Warren, PA. who died December 17, 2008, 2 Brothers – William J. and Jon M. Turner, 3 Sisters – Eileen T. Whisner, Rita E. Yeskey, G. Jeannine Turner, her daughter-in-law, Eileen Swanson Bova who died May 12, 1980. Friends may call in the gathering space of Holy Redeemer R.C. Church, 11 Russell St. Warren 16365 on Friday, April 20, 2012 from 10:30 to 11:30 am when a Mass of Christian Burial will be conducted by Msgr. John Lucas, Pastor, officiating, assisted by Deacon Joseph Lucia. Interment will be in St. Joseph R.C. Cemetery, Warren, PA. Those wishing to place memorials may do so through Holy Redeemer Church Building Fund, American Stroke Association or a charity of choice. E-mail condolences may be made by visiting www.lewisfuneralhomeinc.com. The Donald E. Lewis Funeral Home, Inc. has been entrusted with the funeral arrangements. Very sorry to hear of the passing of your mother. Our condolences to everyone in the family. Words cannot express the sorrow I feel at your loss. Betty will be missed by all. I sure did love her storytelling, & glad to have had the pleasure of spending time with her. May she rest in peace. We used to go to your parent’s grocery store on Canton street in the late 50’s early 60’s. Seeing this made me sad, but brought back many fond memories of finding pop bottles to cash in and buy some penny candy. So sorry to hear of your mom’s passing. We loved Betty so much! Summers on Canton Street were so much fun! We have so many wonderful memories of Mike and Betty.Katie and Alex was so excited to see their adopted grandparents every summer. We loved them very much. Our thoughts and prayers are with all of you. Betty, you were a second mother to me. Living next door to you was a blessing and a joy. I will always remember you with a smile and a tear. Thank you for being there for all of us.